This is not a New Year wind-up. So, please keep reading. 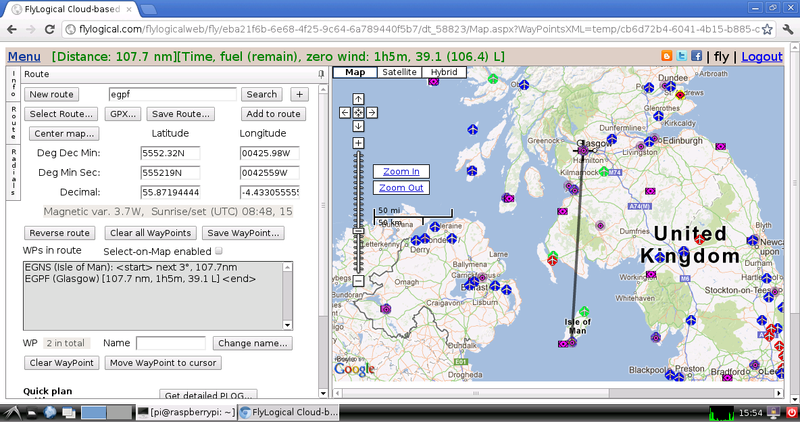 Having bought a Raspberry Pi for my 11 year-old son for Christmas, I couldn't resist trying it out with iNavCalc for flight-planning. If you don't know what a Raspberry Pi is (an ARM/Linux computer for $25), visit this link for an intro. 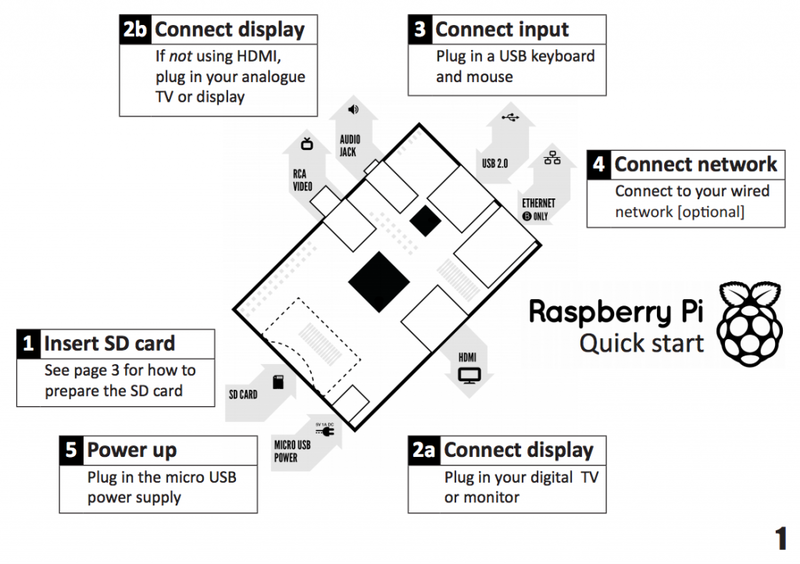 The whole point of the Raspberry Pi is to provide a sensible "bare-bones" platform for teaching kids how to write software, uncluttered by all the fancy stuff that comes pre-packaged with a modern consumer-oriented device such as a Windows or Mac desktop, Android tablet/phone, iPad/iPhone or other such tablet/smartphone. ...demonstrating the full functionality of the iNavCalc web-app, just like on a Windows PC or iPad, etc. 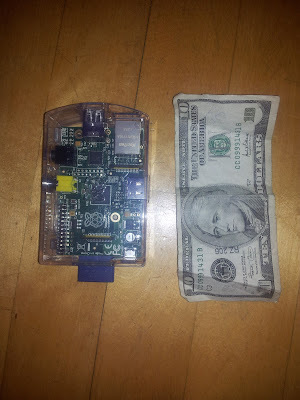 On a more serious note: since I've written the iNavCalc software suite to make extensive use of web-services from the ground-up, it represents a fun and feasible challenge to build a client app (e.g., using Python) to "consume" these web-services on the Raspberry Pi. I'll leave that for another day...and hopefully convince my 11 year-old to help me. Update: with Version 3.0 of the iNavCalc mobile app on Android, you can now import an ".fpl" (or ".gpx") file by clicking on the file (within the Android file-system, e.g., on the SDCARD). Export to ".gpx" (or".fpl") is still carried-out via the iNavCalc email functionality, described below. I have now added support for Garmin AERA 795/796 (and Garmin 1000) flight-plan files (".fpl" format) to the FlyLogical iNavCalc flight planning email- and web-apps. This allows you to conveniently import/export routes to/from your Garmin device (via the SD card) to your other software tools and devices. Why did I do this ? Simple: because I own a Garmin 795 and find it to be a fantastic piece of kit. Far better (in terms of usability, system stability, robustness) than the iPad for use in the cockpit environment. All that was missing was a convenient means of sharing my routes with the unit...now solved. See step-by-step examples below. First create and save a route (known as a "flight plan") on the Garmin (refer to the Garmin user guide for instructions on how to do this). The screenshot below shows some example routes in my AERA 795, with the "EGQL-EGSF" route selected in the list (highlighted). We will use this in the export example. You should see your exported route in the root (top level) of the directory-listing, as highlighted in the above screenshot. The exported ".fpl" file is simply an XML file, structured in accordance with Garmin's own "legacy" schema. If interested, you may open the file with a text-editor to review the contents which are human-readable and generally intelligible, but not very useful until transformed. So, the next step is to transform this ".fpl" file into a portable ".gpx" format which can then be used in wide range of third-party software tools and devices. The FlyLogical iNavCalc app does all the grunt work of transforming the file from ".fpl" into ".gpx". 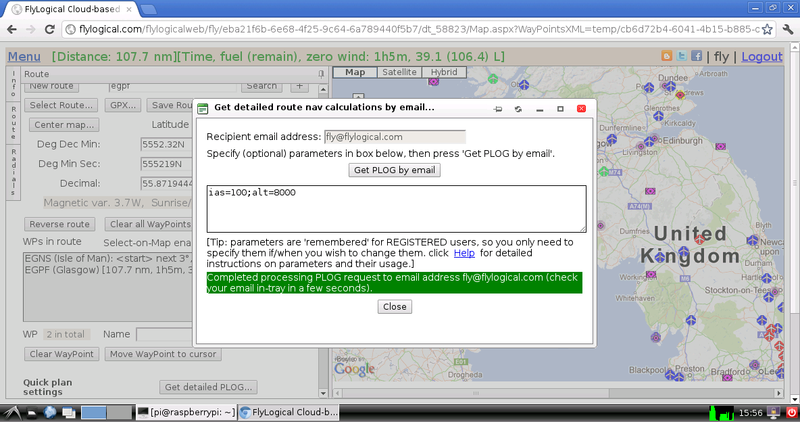 Simply prepare an email to recipient plogs@flylogical.com with the ".fpl" file as an attachment. The subject-line and body of the email can be left blank. The screenshot below shows such an email, ready to be sent. Three of these files are the familiar products delivered by iNavCalc's email-based flight planning calculator. 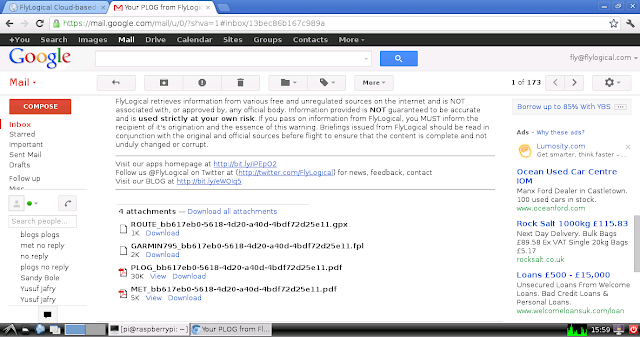 Namely, the "ROUTE_....gpx" file, the "PLOG_....pdf" file, and the "MET_....pdf" file. Of specific interest to the current task is the "ROUTE_...gpx" file which is the transformation of the original ".fpl" file into the open-standard GPX format which is supported by many apps such as, for example, SkyDemon, AirNavPro, Memory-Map, as well, of course, as iNavCalc. The fourth attachment, the "GARMIN795_...fpl" file, is a new feature in iNavCalc. It is a version of the route, formatted in the ".fpl" format for ease-of-import to the Garmin device. More on this in the next usage example below. All blank spaces and non-alphanumeric characters are removed from the waypoint names since these would cause those waypoints to be omitted during the Garmin import process. A search is made against iNavCalc's internal database looking for the geographically nearest entry which has the same NAME as the waypoint in question. If a match is found, then the TYPE and COUNTRY are taken from the iNavCalc database, Note: the TYPE is mapped to those supported by the Garmin ".fpl" schema, namely: "AIRPORT", "VOR", "NDB", "USER WAYPOINT", "INT", which is a subset of the categories available in the iNavCalc's internal database. Otherwise, the TYPE is defaulted to "USER WAYPOINT" (recognized by Garmin), and a search is made against iNavCalc's internal database looking for the geographically nearest entry, regardless of NAME. The COUNTRY of the result of the search is used. If a waypoint from the ".fpl" file happens to share NAME, TYPE, and COUNTRY with a waypoint already present in the Garmin devices's internal database, then the Garmin internal LAT and LON take precedence over those passed-in via the ".fpl" file. In this way, the location of waypoints in the Garmin internal database are unaffected by any alternative values passed-in for the same waypoint identifier. If a waypoint from the ".fpl" file is not recognized as a pre-existing entry in the Garmin devices's internal database, then a new waypoint with given NAME (and of type "USER WAYPOINT") is created on the device. This waypoint thereafter automatically appears in "User WPT" listing. I've successfully tested the functionality described above on a Garmin AERA 795 with software version 3.0.0 (since this is the device/version I own). I have not tested on any other device or version (e.g., Garmin AERA 796, Garmin 1000 etc), but as long as the same ".fpl" format is supported via SD card media (which I understand to be the case for the Garmin AERA 796 and Garmin 1000), then it should all work fine. If you happen to try on other such devices, please let me know how it works out, and I will update this post to reflect those experiences, accordingly. By making use of this functionality on your Garmin device, you do so at your own risk. FlyLogical assumes no responsibility, either with regard to the functionality of your Garmin device, or with your usage of the information generated via FlyLogical.